Common Courage Press, 9781567511123, 221pp. While Hollywood has replaced politics with silly diversions about alien invasions, many Americans face a tangible fear: the seemingly inexorable grip of corporate power over their lives. Wages have been dropping for twenty years. Income inequality that grew under Reagan and Bush accelerated under Clinton. More and more people face an uncertain future as the "land of opportunity" becomes a cynical empty phrase for millions of Americans. 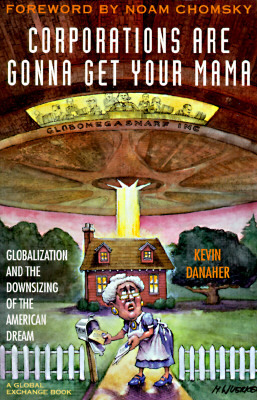 A hard-hitting anthology that includes essays by Noam Chomsky, Ralph Nader, Jeremy Rifkin and others, Corporations Are Gonna Get Your Mama offers an incisive overview of how corporations, long plunderers of the Third World, are unleashing "market forces" like a pack of rabid dogs attacking the American way of life. In "Paying to Lose Our Jobs", Patricia Horn shows that U.S. women, especially women of color, are the big losers in the low-wage bidding game. Each year from 1979 to 1992 an average of 41,000 apparel workers in the United States lost their jobs. Three-quarters of U.S. apparel workers are women, over a third of whom are minorities. This combination makes them the U.S.'s most vulnerable workers. Yet for all the bad news, Corporations Are Gonna Get Your Mama brings you the good news as well: there are hundreds of groups struggling to create more democratic control of the capitol and capital.